The present study evaluated the anti-arthritic and anti-oxidative effects of 6-nitro-1,3-benzodioxane in the adjuvant-induced arthritis model in rats. Arthritis was induced in female rats by intradermal injection of MT37Ra. Arthritis was evaluated by arthritic score, body weight loss, paw volume measurement, and histological changes. The plantar test was used to evaluate the effect of NBD on hyperalgesia. The hyperalgesia (p < 0.0001) and hind paw inflammation (p < 0.034) was significantly decreased with parallel increase in the body weight of the NBD-treated (25 mg/kg) group compared to arthritic control rats. The antioxidant activity analysis demonstrated that the treatment of NBD significantly suppressed the levels of nitric oxide (p < 0.001) and peroxide (p < 0.002) with a significant increase in the glutathione (p < 0.021) compared to the arthritic control group. 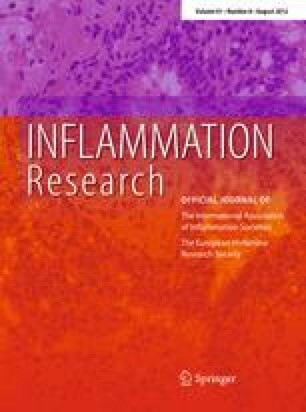 Since the IL-1β and TNF-α are key pro-inflammatory cytokines in arthritis, we therefore measured their levels in the serum samples. In comparison to the arthritic control group, the NBD treatment significantly reduced the levels of IL-1β (p < 0.003) and TNF-α (p < 0.026). Our results suggests that NBD is an anti-arthritic agent that not only reduces the severity of the disease process but also affects contributing factors of arthritic inflammation including free radicals and inflammatory cytokines production.